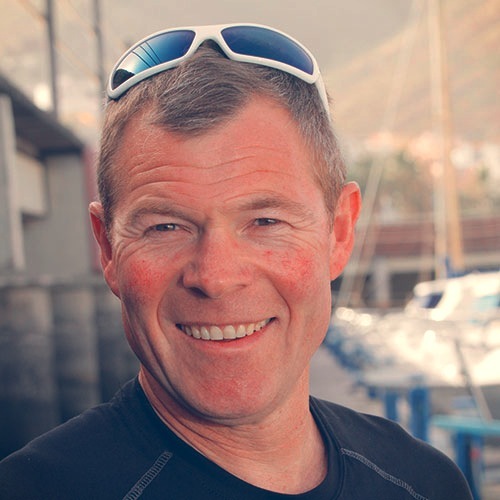 Charlie Pitcher – an ambitious, passionate, determined adventurer, professional ocean rower, world record breaker, avid yachtsman, ultra-runner who is inspired every time he gets up in the morning because “there’s so much to do in life and you’ve only got one chance to do it”. Charlie’s love of adventure and sailing both stem from when he was a schoolboy at Gordonstoun and Rannoch Schools. Charlie spent a great deal of time staring out of the classroom window dreaming of adventures and camping in the wilds of Scotland. He built his first dinghy when he was 12 years old, became a master carpenter and joiner and has been building boats throughout his life. In 1983 he was involved with the America's Cup British team and has been a professional international yachtsman for 20 years. He was part of the successful British teams winning 12 metre World Cup, Admirals Cup, European Championships and was an RYA coach for women's and youth match racing. Charlie’s sea-going focus then shifted towards Ocean rowing. In 2010, he single handedly beat all other solo and pairs boats to win the Woodvale Trans-Atlantic rowing race. This feat was surpassed in 2013 when he broke the world record for the fastest unassisted solo row across the Atlantic by almost 6 days. Both crossings were completed in his own boat designs and manufactured by the company he founded, Rannoch Adventure. To date, Rannoch has designed, built and sold over 60 ocean rowing boats globally. In his spare time, Charlie is an avid ultra-runner. In 2009 he competed in the Marathon des Sables and in 2011 he undertook a grueling 350 mile trail run across Scotland in just 4 days. His rowing and racing challenges have raised in excess of £350,000 for various charities and in 2014, Charlie was awarded The Mountbatten Sword for Inspiration by The Queen at Buckingham Palace. He regularly undertakes motivational public speaking engagements as a role model for aspiring adventurers. Charlie is married, lives in Essex, has 4 children, a beloved dog called Ula and a 45 ft sailing boat called Nala which allows him precious time with his family.